Significance: The Remotest Region Of India. 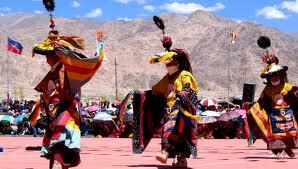 Ladakh is a land like no other. Bounded by two of the world's mightiest mountain ranges, the Great Himalayas and the Karakoram, it lies athwart to two other ranges, the Ladakh range and the Zanskar range. 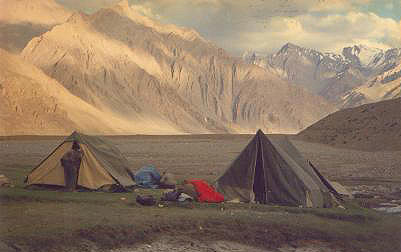 The best time for a trek in Ladakh is July to September. By air: Leh is connected by air from Delhi, Chandigarh, Jammu and Srinagar. By road: Leh can be reached by road from Manali by covering a distance of 471 kms over some of the highest passes in the world. 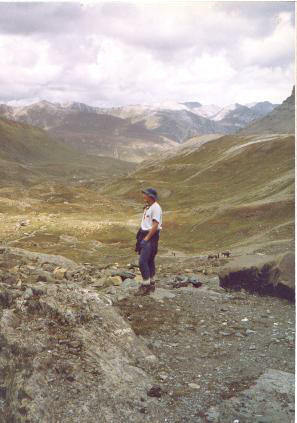 Alternatively Srinagar is connected to Leh by Zozila Pass. High grade trek routes (3/4c) converging on Leh via Padum in Zanskar. Also start from Kishtwar over the Sersank and Pota La and from Zanskar crossing the Charcharal. Perhaps the most popular pass of all is the Shingola which still serves as an arterial route (19 days/3C) from Lahaul to Zanskar. 7/8 trek days from moderately high passes (3C) end with visits to the Markha valley, Stok Village and the celebrated Hemis Monastery. The season is also marked by higher water volume in the Indus enabling rafting excursions from Leh down to Nimmu near its junction with Zanskar River. Acclimatisation is essential. 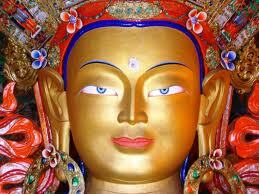 Day visits from from Leh can be taken to the Buddhist Monasteries dotting the Indus Valley. 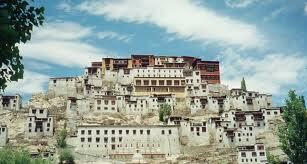 Leh bazaar itself harks back to the oldest trade routes to Tibet. Inner line permit is required for trekking in certain areas of Ladakh which may be obtained from J & K Tourism office in Delhi or the district magistrate office in Leh or from the Indian Missions abroad. 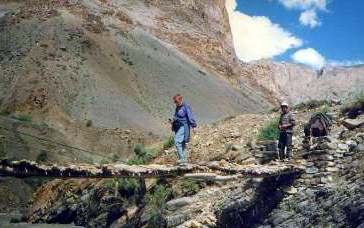 The Zanskar sub-division of Kargil district is centered around its main settlement at Padum (3505m). Four main routes pass up to 5000 m converge here from Lahaul in the Chenab valley, Kishtwar, Suru Valley and Leh. Truly one of the most desolate places in the Himalayas, Zanskar is known for its spectacular scale, hardy mountain folk and extreme winter when the Zanskar river freezes to form the "Chandar" over which mail runners operate. On the North and Eastern exits of the Indus valley in Ladakh there are two of the world's highest motorable passes: Khardungla at 18,3000 ft from the Nubra valley and Taglangala at 17,500 ft on the Manali road. The former is Karakoram gate-way to the vast confluence of the Shok and Nubra rivers, Saser Kargil peak and its associated lofty ranges. Eastward in the same district, over the Changala at 17,000ft, the road winds its way to the barkish Pangyong-tso and Tso Moriri lakes at 14000 ft on the edge of the Tibetan plateau, where the traveller may sight the nomadic herdsmen of the Changthang, the black-necked crane or the elusive snow leopard. Down the Indus from Leh, the route branches off for the a Hanu region inhabited by the Dards reputedly descendants from the armies of Alexander The Great. 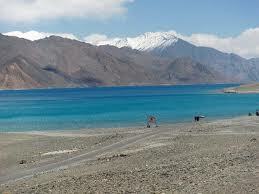 Kargil (2705m) is now a district head-quarter and is 234 kms from west of Leh. It held its own importance on the earlier commercial map. A further 60 kms west of Kargil is Drass (3230m), reportedly one of the coldest places in winter. But it is Kargil's Suru Valley on the edge of the Great Himalayan range that leads in to the region of Pannikhar, Saukhoo, the Ringdum Monastery. A number of 2/3 treks in the area provide close ups around the Nun & Kun peaks.